Flickr/Die Linke. Some rights reserved. 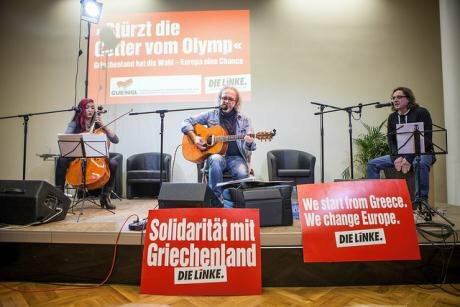 Tsipras received a riotous applause when he spoke at Die Linke’s congress in May 2014. Addressing the room as a “sister party” he spoke of the need to “overcome the north south division” and fight “the ghost of fascism in Europe”. In emphasizing these factors, he brought with him an unexpected solidarity, arguing for Greece’s role in supporting the struggle of workers in the wealthier North. The party’s EU representatives, such as the young Katja Kipping, have spoken of the need to echo Syriza’s critique from “the belly of the beast” as a component in building a social Europe. It is vital to recognise, though, that for Die Linke this means something quite specific, namely building a narrative about precarity and structural inequality against the prevailing ideology of ‘Merkelism’. While Syriza must provide solutions for many in absolute poverty, Die Linke are more concerned with: “the agency worker; the self-employed on their laptop; the unemployed person who is stressed because they have to go to the unemployment office and be subjected to all sorts of pressures and humiliations”.